The Precambrian is sometimes referred to as an "eon." However, it actually has no rank. It is simply Precambrian time. The Precambrian is that stretch of geological time from the formation of the Earth itself to the start of the Cambrian period. This immensely long stretch of time - some four billion years or more - saw the formation of the Earth as a planetary body, including geosphere, atmosphere, and hydrosphere, as well as the appearance of the biosphere and hence the transformation of the Earth from a dead planet to a living one. During the eighteenth century geologists first began mapping the strata of the earth's crust. In doing so they frequently found a "basement complex" of igneous and metamorphic rocks beneath the lowest sedimentary layers. These were called the "Primitive" or "Primary", although the term "Primary Era' later came to be applied to the oldest sedimentary stage (later to be called the Paleozoic). In 1835 the English geologist Adam Sedgwick used the name "Cambrian" for the oldest sedimentary strata. Thereafter the underlying rocks were term Precambrian - "before the Cambrian". During the twentieth century the term "Cryptozoic" - age of hidden life" - was used to designate this period, whilst Phanerozoic - "age of obvious (or revealed) life" - was used for those periods from which fossils of multicellular organisms are known (i.e. the Cambrian period to the present-day). Although the latter term is still in use, "Cryptozoic" pretty much disappeared in favor of the older and well established Precambrian. Diagram from Precambrian - Fig. 1., Oasis in space: Earth history from the beginning - Time, Life, Evolution, Earth, Million, and Eon, based on a diagram by Preston Cloud. (Cloud 1988), showing the chemical and mineralogical evolution of the Earth's crust and atmosphere, along with impact craters, glaciation events, and the evolution of life. Although life appears fairly early, following a period of prebiotic chemical evolution, it is only towards the end of the Precambrian that complex organisms arise. A newer version of geological eras and the Precambrian, from Wikipedia. As shown here, the Precambrian includes by far the majority of geological time. Much of this immensely long interval dominated almost entirely by microbial (and there mostly simply bacterial) life. 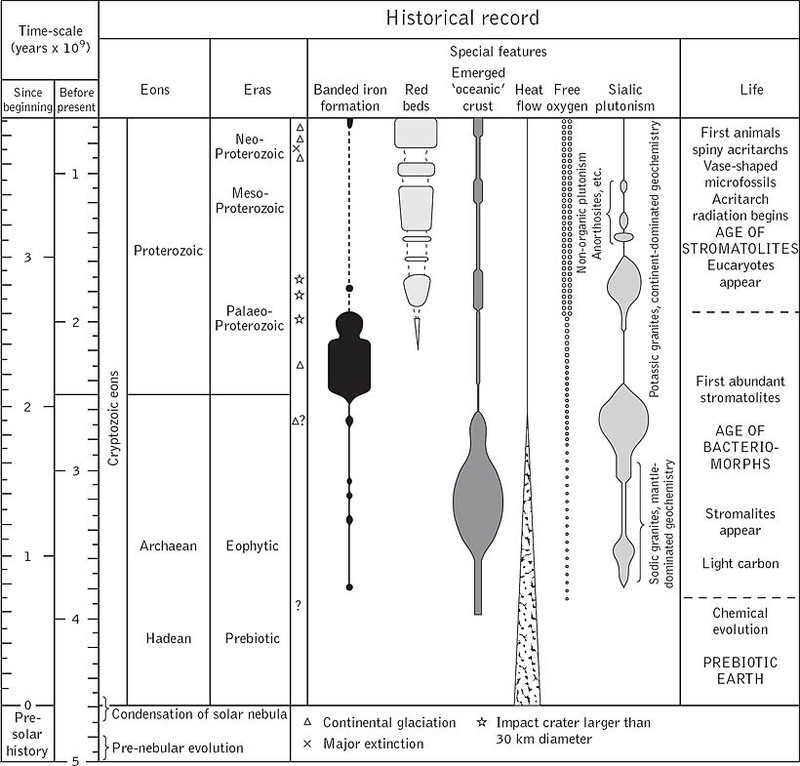 The fleeting periods shown as narrow coloured bars to the the far right of the chart represent the familiar Phanerozoic geological timescale, characterised by life above the microbial and algae mat stage. Because Precambrian time is so long, it is useful to divide it into stages or eons. Originally the Precambrian was divided into a more recent Proterozoic ("age of first life") a preceding Archeozoic ("first life") and an even earlier Azoic (lifeless) era. Currently, Archeozoic and Azoic have been replaced by Archean ("first", "primary") and Hadean the latter term referring to the hellish conditions of the very early Earth. Late, the term Priscoan was also used to refer to the period where the geosphere was still forming an life had not yet come into being, this being a synonym of Hadean. These three eras, the Hadean, Archean and Proterozoic have recently been promoted to the status of eons, although both the Geological Society of America and the International Commission on Stratigraphy have chosen to ignore the Hadean. The Archean and Proterozoic are both divided into various eras. More recently, there has also been a proposal (how successfully this catches on remains to be seen, but we have adopted it here at Palaeos) that the Hadean be itself divided into two, the Hadean proper (referring to earliest stages of the development of the Earth) and the Chaotian, which refers to the formation of the solar system as a whole. Following are two tables - one (by the ICS) ignoring the earliest stage of Earth's formation (from which there are no surviving terrestrial rocks) and presenting a simple division of Archean and Proterozoic Eons into eras, and the other (based on Harland et al) having a larger number of Precambrian eras and periods. We follow the ICS system, but recognize a separate Hadean and Chaotian eons. Disclaimer: We didn't make up this horrendous color scheme. Except for the Hadean and Chaotian colors, all of the color coding for time periods is the official scheme used by the ICS. International Stratigraphic Chart, International Union of Geological Sciences: International Commission on Stratigraphy, 2001, published by Micropress. The above table is based in part on the material available at Jeff Poling's Geologic Ages of Earth History page. It uses Precambrian periods and dates from A Geologic Time Scale 1989 by Harland, W. Brian, Richard Armstrong, Allan Cox, Craig Lorraine, Alan Smith and David Smith. Formation of the Solar System and the Earth. Formation of the rocky Earth out of collisions of planetoids. Formation of the Crust - Anorganic Chemical and physical Macrodynamics, Cosmic bombardment from comets and planetoids. Primal Ocean, Organic Substrate, Abiogenesis, Informed biomolecules, reducing atmosphere. Present crustal structure, Planetary Ocean, Formation of the continents and archaic regime of Continental drift. Gaia (Chemically and thermally self-stabilizing biosphere) - Bioenergetic Processes - Prokaryotes Archaea, Eubacteria and Urkaria) - reducing atmosphere, Oxygen Crisis and the decline of the Archaea, colonial stromatolites. Endosymbiosis (Eukaryotes). Continental drift (present regime) begins. Proterozoic Ice Ages - Precambrian Pangeas. The first multicellular organisms. As explained above, the evolution of life can be divided into two very unequal periods: the very long Precambrian (lasting over 3 billion years), when life for the most part remained at the microbial grade of organization, and the much shorter Phanerozoic, encompassing the Paleozoic, Mesozoic, and Cenozoic eras (about 540 million years in all), when much more complex, multicellular life, has flourished. The diagram on the left shows the comparative difference in duration of these eras. Thus throughout most of the period the Earth has been in existence, there has been life, but life of a very primitive kind, analogous to modern bacteria. These single-celled microorganisms are distinguished from more advanced life in that their cells are not compartmentalized into distinct organs, but rather are of a simple and uniform nature. Such uniform cells are called Prokaryotes (the micro-organism illustrated at the left of the above figure), and they appeared long before the more complex cells, or Eukaryotes (shown at the right on the diagram). The accepted paradigm at present is that Eukaryotes are built up of Prokaryotes that came together in a symbiotic relation; the different organs of the cell descending from different prokaryotic organisms. It was only at the very end of the Precambrian that there was a sort of "quantum leap" in evolution from simple microbes to complex multicellular organisms. Cloud, P. (1988) Oasis in space: Earth history from the beginning. Norton, New York. Goodwin, A. M. (1991) Precambrian geology: the dynamic evolution of the continental crust. Academic Press, London. Nisbet, E. G. (1987) The young Earth: an introduction to Archaean geology. Allen and Unwin, Boston. Plumb, K. A. (1991) New Precambrian time scale. Episodes, 14, 139-40. Stanley, S. M. (1993) Exploring Earth and life through time. W. H. Freeman, Oxford. University of California Museum of Paleontology -- The Divisions of Precambrian Time - an introduction to the Precambrian at the University of California Museum of Paleontology site. Precambrian (Pamela Gore lecture notes). Earth - The Genesis of a Living World.